…to all the friends and family who keep me from going batshit crazy. If it weren’t for y’all, I think I really WOULD flip out and become “Crazy Dog Person” or something. Kathy and Marty, GO HOGS! Robert, you’ve been in for the long haul. Thanks for putting up with me. Keith, like my Grandfather, you truly fit the term “Christian Gentleman”. Not many reach that status with me. (there are four, of which you’re one). Thank you, Matt, for being so loving, considerate and kind. Your smile really does light up every room you’re in. Having you here has been wonderful for me. Nathan, I just couldn’t go on without you. All those shared experiences, and all that is to come. Nathan and Matt: y’all pick me out a nice nursing home. I want a beach view, so I can sit there in my caftan, big floppy hat, Jackie-O sunglasses, clogs, a cigarette and an enormous cocktail and look out at the passing crowd. (Think Albert in The Birdcage). Who knows, maybe I’ll find some old coot and get married off before then….my computer dating match-thingy keeps wanting to put me with 65 year old guys in Connecticut. Quite a commute from Houston, especially when I put MY age as the “top limit”. Come on, doesn’t some nice 45 year old want a nice older guy? Looks like it’s going to be one of THOSE nights, since it’s 2:00AM, I’ve taken my sleeping potions, and I’m wide awake. Nathan requested this blog, so I might as well write it. I can speed read. My sophomore English teacher (with whom I credit, along with my 6th grade teacher and my senior Honors English teacher, my ability to write a correct sentence in the English language) gave these little pop quizzes, to make sure you read the assignment. If you read it, it was a snap: “On page 93, Tom is having a conversation with someone. Who was it?” The answer is “Jim”, and if you read the chapter she indicated, you knew that. If you didn’t read it, you didn’t; your score, therefore, was either 100 or –0-. After a few of these (I always had a perfect 100% on my quiz scores), she asked me to stay after class. “I’ve noticed that your answers are not exactly correct as far as the question itself, but it’s obvious you have read the material. When did you read the book?” “The night you assigned it.” She’d assign, say, Huckleberry Finn. I’d take the book home and read the whole thing in one night. That way, I just kind of had to coast along while she gave her little quizzes, and I could pretty much summarize/analyze anything I read. After that, she set me up with a speed reading course at San Antonio College, and I learned to speed read. It’s very helpful sometimes; not great when you’re reading the intricate details of, say, a contract or an insurance policy, but great when faced with research. I still read very fast (when I can stay awake). I read “The DaVinci Code” in about 4-5 hours sitting on a beach in Florida, for example. I don’t actually read the words, I read sentences and sometimes paragraphs in toto. So, if I’m reading for pleasure, I have to purposely slow it down. Math: While not very good at math (I’m terrible with fractions and percentages, and let’s just say that geometry and I don’t get along at. all., though I am actually very good at –gasp- algebra! ), I can still add, subtract, multiply, and divide in my head. The same year I learned to speed read, I learned speed math. I can add a long column of figures quickly in my head, and I can add very large numbers and get pretty close if there aren’t too many—say 6 or 8 tops. Of course, I mostly use Excel now—but I can still do without it. One of my first HUGE crushes on any recording artists was Glen Campbell. 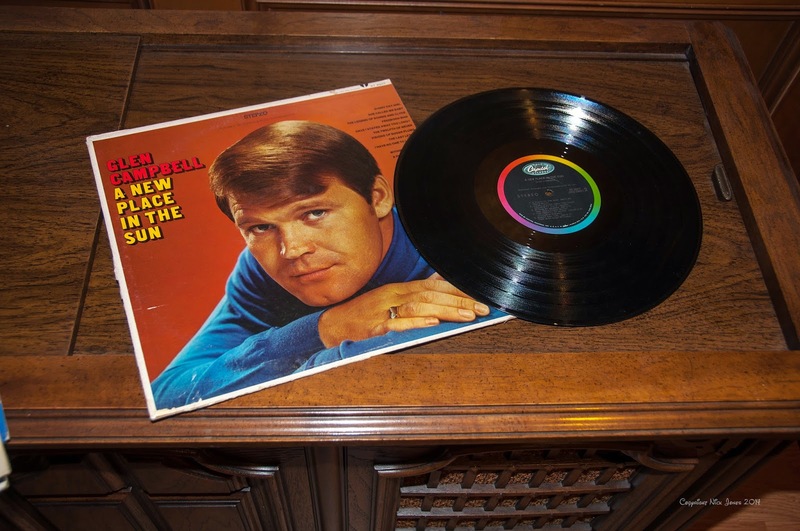 He had been a successful studio musician (I hadn’t known that until recently) when the Smothers Brothers tapped him to be their summer replacement show, “The Glen Campbell Goodtime Hour”. He was a fabulous guitarist, his vocals were great, and, er, um, he was easy on the eyes. The news came out today that he is being moved to an Alzheimer’s facility. He was wealthy and living at home, so if he had to be institutionalized—it’s pretty much gone. CBS Sunday Morning covered his Farewell Tour. My Mother (who never learned to read well) suffered from dementia. She was terrified of mental illness, so we never actually told her that diagnosis. She knew us until the very last, but there was only a tiny flicker left. My Grandfather (Dad’s father) went completely away. He thought it was 1933 and FDR had closed the banks. He didn’t know us at all. Dad (though at 90 you have to say, “bravo!”) is getting dimmer and dimmer. He’s still here, still drives, still knows all sorts of things—but it’s getting harder for him and there’re just a whole lot of things he no longer remembers at all. It’s happening to me. It’s the beginning stages, but it’s happening to me. Matt has moved to Houston and is living with me currently. He good-naturedly stops me when I’m telling him the same story I told him yesterday. I’ll have no memory of having told him. So, maybe these memories will be here for anyone who wants them.